A group of scientists placed 5 monkeys in a cage and in the middle, a ladder with bananas on the top. Every time a monkey went up the ladder, the scientists soaked the rest of the monkeys with cold water. After a while, every time a monkey went up the ladder, the others beat up the one on the ladder. After some time, no monkey dared to go up the ladder regardless of the temptation. Scientists then decided to substitute one of the monkeys. The 1st thing this monkey did was to go up the ladder. Immediately the other monkeys beat him up. After several beatings, the new member learned not to climb the ladder even though (the monkey) never knew why. A 2nd monkey was substituted and the same occurred. The 1st monkey participated on the beating for the 2nd monkey. The 3rd monkey was changed and the same was repeated (beating). The 4th was substituted and the beating was repeated and finally the 5th monkey was replaced. What was left was a group of 5 monkeys that even though never received a cold shower, continued to beat up any monkey who attempted to climb the ladder. 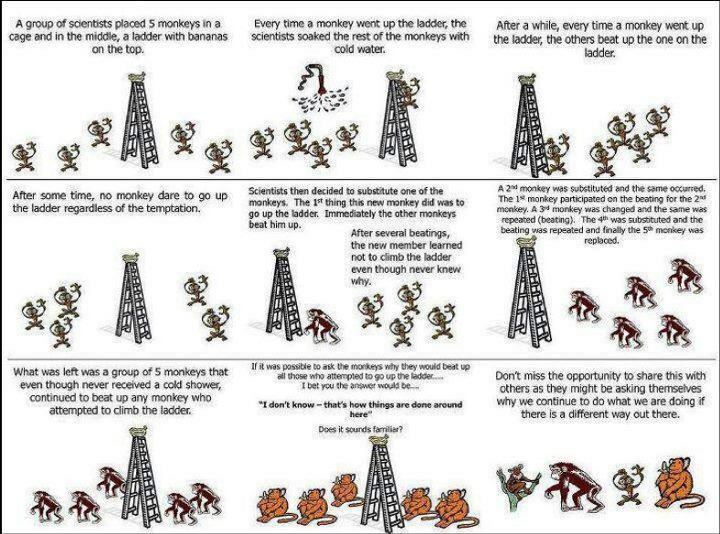 If it was possible to ask the monkeys why they would beat up all those who attempted to go up the ladder… I bet you the answer would be “I dont know- that’s how things are done around here” Does it sound familiar? Don’t miss the opportunity to share this others as they might be asking themselves why we continue to do what we are doing if there is a different way out there. If there was a better way to live/eat/sleep/work… how would you know? New ways of doing things always sound crazy. Until it works. And then it’s genius. Thinking outside the box requires courage, craziness and a thick skin but in the end, it’s all worth it. “I HATE Rogers!” -every Rogers customer ever. What reddit has taught me about life.